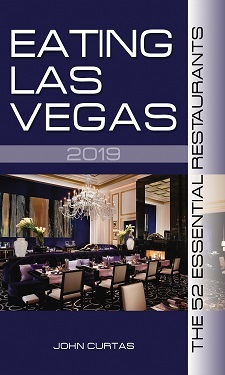 Dec. 11, 2012 marked the 20th anniversary of Spago’s opening in Caesars Forum Shops and everything about this place has remained rock solid from the get-go: The pizzas, pastas, and wienerschnitzel are just as tasty today as they were on the day it opened. The house-made charcuterie is not to be missed, nor is Klein’s superb tarte flambée, prepared with house-made fromage blanc (of course). Little known fact: the mini-burgers here are the best in the business. Be advised though, these days, the kitchen has gotten on the seasonal bandwagon in a big way, and the menu is in delicious but constant flux. In keeping with Klein’s restless nature, one visit might find you swooning over a steamed Scottish salmon “Hong Kong style,” while another might have you digging in to one of the best braised short ribs in the business. But no matter what you order, you can be confident it will arrive on the plate with precision and style. Be sure and save room for whatever special sweet Kamel Guechida’s crew has created for your dessert delectation. 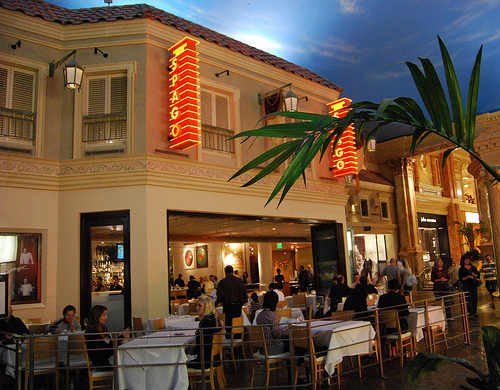 If all of these tasty treats aren’t enough to keep you interested, the outdoor/indoor cafe also boasts the best people watching in Vegas. Another fun fact: Tell G.M. Carlos you’re a local and they will miraculously find a table for you on all but the busiest of days. Favorite Dishes: House-Smoked Salmon Pizza; Lamb Chorizo Pizza; Wild Mushroom Ravioli; Blt Salad Wedges; Pork Wienerschnitzel; Choucroute Garnie Royale; Red Wine-Braised Short Ribs; Mini-burgers; Scottish Salmon “Hong Kong Style”; Any Of Kamel Guechida’s Desserts. I’ve had many fabulous meals at Spago over the years and have never been disappointed. In the summer, the bar serves a bracing, fresh blueberry mojito and the plate of warm cookies, (not on the dessert menu), reminds me of the spritz butter cookies my Mother made for Christmas. Chef Klein is a consistent, unassuming, gracious craftsman that doesn’t need a schtick or reality show to define his worth. I implore you to go into spago one night and have Eric craft for you a tasting menu. You owe it to yourself. …I really need to get over here in order to see what Kamel, et al are doing. The dessert tasting he crafted for my family as a Christmas gift a few years back is something my mother still talks about to this day.